Because I travel to Malaysia almost every year, I've been almost everywhere in Malaysia. Thie idea this year was to see some of the places where I haven't been yet. These are either off the beaten track places or places which are hard to get to, either because you need an expensive tour or because it's difficult to make reservations. I've had these places on my list for a while already, but a reason or another I never managed to visit them. This year I managed to get to several of these places. I went again to Sabah, because despite being a relatively small Malaysian state, it has an incredible wealth of locations (mostly natural) to visit. Then I covered some locations in West Malaysia by renting a car. If you have to rely on public transportation or tour operators it's very difficult to visit exactly what you want to see in the planned time frame or ir can be expensive. Development in Malaysia has slowed down quite a bit over the past 10 years. Unlikely that they'll manage to realise their Malaysia 2020 vision (Malaysia being a developed country by 2020). Generally speaking the cost of travelling and living has gone up quite a lot in recent years. That's especially the case in KL and Sabah, where costs have increased significantly since 2007-08. Outside of these areas travelling costs are still moderate - higher than in Thailand and Indonesia, but far lower than in a western country. Since I was rushing from a place to the other and was spending a lot of time in remote jungle areas, my food on this trip was quite unimpressive. Fried chicken and rice in KFC restaurants. Instant noodles and cookies in the jungle areas, just to make some examples. Only a few times I could eat in a good restaurant. But generally speaking, in Malaysia in the bigger cities there are plenty of restaurants offering a wide variety of dishes. There are countless hotels, guesthouses and homestays in Malaysia. Even in the national parks in the jungle you can find more or less good accomodation. I was surprised to find modern and clean accomodation, spotlessly clean rooms with A/C in the middle of the remotest jungle in Sabah. Most hotels offer free WLAN access in the room, with variable quality. I also relied on the mobile phone (using it as a mobile hotspot). Tropical weather with a mix over sun and rain. August is still the dry season in all of Malaysia, although it rains almost every day a bit. For Malaysia the usual set of tropical immunisations are needed. The malaria risk seems to be moderate even in the jungle areas (was told staff who had spent one year in the area didn't catch malaria), so I didn't take anti-malaria pills. VISA on arrival for EU nationals and nationals of several other developed countries. No problems in Malaysia. It's a safe and stable country. The Kenyir lake is a not well known area, but is surrounded by beautiful rainforest. The Maliau basin is an interesting wildlife area in the heart of Sabah. The Imbak canyon in Sabah has some beautiful primary rainforest and is very much off the beaten track. The Crocker range national park was another pleasant surprise. Beautiful rainforest, waterfalls and rafflesia flowers. Pekan is ok, but for a royal capital I would have expected a bit more. Both in west Malaysia and in Sabah I rented a car to get around. Without it, it would have been impossible to visit all places I saw. For instance, there is no public transportation to the Maliau basin and the Imbak canyon. Without a car you would need a car+driver to visit these places or some tour. Hotel Sentral, KL. Decentr room for 145 RM with A/C, TV, phone, fridge, electronic safe, hairdryer, some furniture. Toilet with shower. The hotel is about 200m from the KL Sentral train station. WLAN in the room, usable. Good shower with plenty of water. I leave home quite late at 7:30pm and drive towards the Trudering train station, then arrive at the airport without problems (half-empty train) at 8:35pm. There I proceed to the check-in counter. Some queue, but not much. I'm probably the last passenger to check in on the Oman Air flight. Then I go through passport check, security and finally wait in the gate area. Shortly before 10pm I'm in the plane, an oldish Airbus A330 with eight seats per row (2-4-2). The plane is almost full. The flight takes off at 10:25pm, with just 10 minutes of delay. In the seats of the economy class there are USB charging sockets, but no A/C power sockets. The dinner is ok, but unimpressive and a bit less plentiful than the one on Emirates flights. I watch a movie, then try to catch some sleep, but can't really because my seat is a bit narrow and can't be leaned so much backwards. We land in Muscat shortly after 6:30am local time, a few minutes ahead of schedule. Things then proceed quite smoothly. We board the bus which brings us to the terminal. Then they check and stamp your boarding pass, you pass a security screening and are already in the gates area. It's a relatively small airport. Shortly after 7am I'm at the gate. Free WLAN in the airport (you have to request an activation code by SMS). We take off with some delay at 9am, but land in KLIA at 8pm. Then it takes forever to go through passport control (very slow). After that I retrieve the luggage, walk out, get cash from an ATM and walk to the KLIA Express train station. I manage to catch the 9:20pm train to KL and reach KL Sentral shortly before 9:50pm. There I meet Shirley, the kids and her sister Sara. Some chit-chat, then I head to the hotel. Chalet in the jungle camp of the Endau Rompin national park (western part of the national park, access from Bekok). 180 RM for a large wooden chalet with attached bathroom. Only fan, no A/C. Relatively basic accomodation, but at least there is electricity the whole day. The bed consists of one mattress and one sheet. Weather: overcast in the morning in KL. Also overcast with every now end then some sun in the area between KL and Johor. Heavy rain in the Endau Rompin national park after after 5:20pm for about one hour. Due to the jet lag I wake up at 6am and can't sleep anymore. I rest a bit in the bed, then get up, take a shower and pack my stuff. At 9:40am I check out, then walk to the KL Sentral train station. There I have some food at a KFC restaurant, then travel to KLIA2 by KL Express (RM 55). Shortly before 11am I reach the car rental area in KLIA2. After some waiting the clerk arrives and we do the paperwork. I get a Nissan Almera with 95000 km, full of small and large scratches and damages here and there. Despite this, the car seems to be ok (although the engine is a bit weak). At 11:30am I start driving towards Bekok. Initially it takes some time to familiarise with the new car. I face the first problem when I reach the first toll station. I drive in, but nobody is there. Seems to be a fully automated system, for which you need a chip or card to pass through. Takes some time to figure out that the only counter with a human being is the one on the right. There I'm told to buy a plastic card (10.60 RM) which I need to top up with 50 RM. Then I continue driving. From now on it's a 180 km drive on the north-south motorway. The motorway is not very good. The surface is not perfectly smooth and the lanes are a bit narrow. Then there are speed limits sometimes when it makes no sense. Variable traffic levels on the motorway. I refill the petrol tank (RM 60, 1 litre is 2.12 RM). I reach the office of the Endau Rompin national park in Bekok at 2:50pm. I park the car and then register in the office. Some discussion on the prices. Why do they charge RM 360 for one day of trekking with the (compulsory) guide. For comparison, in the Maliau basin the guide costs RM 240 for three days. Some discussion and they lower the price to RM 280. I buy some food in a store (self-catering; a meal package would have cost an additional RM 255), then at 3:20pm we start driving towards the Endau Rompin national park in a Toyota Pajero 4WD car. Initially the road is paved and good. But the closer we get to the national park, the worse the road gets and the last section is a bad dirt track. For a good section of the road we drive across oil palm plantations. In the end we reach the rainforest, but it's not a nice rainforest with huge, majestic trees. Rather it seems to be pretty much secondary rainforest, at least in this part of the national park. We reach the rainforest camp around 4:30pm. 400m from the chalet area there is a camping area. I unload my stuff and have a look at the place. After some exploring I manage to find the starting point of the trails to the waterfalls. When I'm about to start walking on those trails, at 5:20m, it starts to rain heavily. I wait for some time under a shelter, then walk back to my chalet. In the evening I don't do much. Ancasa Royale hotel, Pekan. RM 221 for a giant, high standard room. Two queen size beds, nice stylish furniture, TV, fridge, table with chair, couch, even an ironing board with an iron. About 3km out of Pekan. Freezing A/C in the room, which can't be switched off or adjusted. Weather: overcast in Endau Rompin until about 2pm (eve some rain), then the sun comes out. Not too hot in the evening in Pekan. I wake up at 5am, then can't sleep anymore. I was expecting a jet lag and difficulties to get up in the morning, so booked the guide for 9-10am. At 9am I leave the chalet and look for the guide. Nobody is there, so I call the park office. They say that the guide will come after 9:30am. So I walk around a bit to the river. There, at 9:20am I meet my guide for the day. It's actually a park ranger, who occasionally jumps in to help as a guide. He'll be ready at 9:30am. So we start walking along the river initially. We'll spend the next five hours walking and climbing in the rainforest. I must say that the Endau Rompin national park has some of the worst trails I've ever seen. Poorly maintained, extremely steep in some sections, very slippery during and after the rains. The rainforest is not that terribly scenic: in this area there are not that many huge, majestic old trees. We'll reach first the Takah Tinggi waterfall at 10:50am, then the Takah Tempaang waterfall at 12pm, followed by the Takah Selow waterfall at 1pm and finally the majestic Takah Pandan waterfall at 1:50pm. After the first hour I start walking very slowly, have no more stamina. Must be the lack of acclimatisation, the jet lag and the lack of training. The trails are also very, very slippery. In some sections, the trail is so steep that in reality you are climbing a steep mud wall, pulling yourself up with ropes (and later abseiling with the same ropes). I slip countless times, but luckily don't get hurt, except for some scratches. But my clothes and shoes get full of mud. Lots of leeches by the way, but I don't get bitten because I'm wearing long trousers and leech socks. However I have to remove many times leeches who are climbing up the trousers or are hiding on the shoe. We can't do all four waterfalls today because we would need to take shortcuts through streams and I can't walk with my shoes in a stream. I would have to take the shoes off and wear them again later, and that takes too much time. My guide has rubber shoes and can walk through the water. We could take a different path which doesn't involve crossing rivers, but that would add two hours to the trek. I'm back in the chalet at 2:40pm. There I call the park office and ask for a driver in half an hour. In practice the driver will be here at 3:40pm. Driving back to the park office takes longer than yesterday. We'll arrive at 4:50pm. Then I get back the RM 50 key deposit and buy some food in the nearby grocery store. At 5:15pm I start driving towards Pekan. It's supposed to be a three hours drive, but with stops along the way and a traffic jam caused by a convoy of slow trucks very hard to overtake, I reach the hotel in Pekan 8:50pm. There are several problems when driving in Malaysia: rental cars are not so good, roads are bad and not well signed, some drivers have poor driving discipline. Once in the hotel I wash the clothes which got muddy today in the bathroom. The Serai Cottage Boutique Hotel, Kuala Berang. RM 108 for a nice single room, with TV, adjustable A/C, clean, attached bathroom with shower, very basic but functional furniture. Fastest WLAN since I've been in Malaysia this year. It's finally possible to watch movies on Youtube. The hotel is somewhere in Kuala Berang. Weather: mostly overcast with every now and then (especially between 10am and 2pm) sun. After 5pm rain, heavy rain on the road to lake Kenyir. Mostly rainy in the evening around lake Kenyir. I sleep until 9am, then get up. At 11:20am I leave the hotel and drive into town to the Istana Abu Bakar palace. The problem is that this palace is not open to the public, so I only see the gate and some of the garden. Next I try to get to the Abu Bakar mosque which is shown in the Lonely Planet guide as an attraction. The problem is that this mosque doesn't seem to exist, so instead I drive to the Sultan Ahmad mosque. This is a picturesque mosque with a beautiful inner hall, located about 1 km northwest of the centre of Pekan. The mosque is open for visitors and empty when I visit it. At 12:10pm I leave for the next place, which is the area of the two mosques indicated in the map in the LP guidebook. I manage to find a mosque and some other white building, but it's not clear whether this mosque is the one indicated in the LP guide. Seems that this map is inaccurate. Then I park the car next to the historic core (a block of shophouses) of Pekan. Not much of a historic core, not for a (supposedly) former royal capital. In fact, Pekan is less interesting than I was expecting. It's a beautiful small city in a picturesque setting along a river, with many colourful houses and lots of life, but it lacks significant sights. I have some lunch in a KFC restaurant, then continue walking around in Pekan. After 2pm the streets fill up with schoolchildren. I manage to find the Chinese temple and the Indian temple. The latter is closed and in disuse. Then I walk back to the car and along the way buy some food in a supermarket. Shortly after 3pm I start driving to the Kenyir lake. The idea would be to have a look at the area around the jetty which shows a lot of development according to Google Maps. The drive proceeds mostly smoothly. Initially I drive on land roads, and after some time reach the motorway to Kuala Terengganu. This is almost empty today. The last 45km of the road are again a land road, a not very good one. I reach the jetty of the Kenyir lake at 6:20pm. It's now raining, and the rain will become stronger over the next 20 minutes. At the jetty there are several large houseboats, each of which able to accomodate 10-20 people. But they seem all abandoned, or in disuse. Can't be the wrong season, because the bad season is the winter monsoon from November to February. It looks like a lack of business. And the main resort, the Lake Kenyir resort & spa, is closed. I'll have to come back tomorrow and check again, but right now lake Kenyir looks like a failed tourist place. In fact, I was hoping to stay in one of the many hotels around Lake Kenyir. But there are none - I spend some time looking for a hotel, and the closest open one I'm able to find is in Kuala Berang, about 30km from lake Kenyir. I'm at lake kenyir until 7:25pm, then drive to Kuala Berang arriving there at 8:10pm. Lipis Centrepoint hotel, Kuala Lipis. RM 60 for a basic room with A/C, TV, attached bathroom with shower, some furniture. For the price I can't complain (breakfast included). It's RM 60 via booking.com, but in the hotel lobby they advertise RM 48. However when I call on the phone to ask if they have a room, they say no. But later, when I book over booking.com, suddenly there is one available room. Maybe the RM 12 difference is the commission which booking.com get. Weather: in the morning a bit overcast, then the sky opens up. Later in the afternoon it's overcast again. After 5pm it rains until about 6:30pm, then later after 7:30pm a bit. I check out late after 11am. Chit chat with the hotel staff about the Kenyir lake. They say that there are a lot of attractions at the lake, with more being built. It's just that yesterday evening when I arrived everything was closed. These are all around or accessible from the Pengkalan Gawi jetty. So I get into the car and drive again to the jetty. At 12:10pm I'm at the Kenyir information centre near the jetty. There I collect some information about the lake and the whole of Terengganu. Short discussion with the staff about the things to do and see today. Prices for boat trips are in the RM 100 - RM 300+ range for the whole boat, depending on what you do. Then I drive down to the jetty and enquire about boat trips with some Malay guys who are sitting at a table. They initially tell me there is a boat which is leaving, which would be good because I could share the cost. But later it turns out that actually we are just waiting for the boatsman to come (they called him). So the guy finally arrives. Discussion about price and itinerary. In the end we settle for RM 170 for a three hours trip, to three places: the herbal farm, the butterfly farm and the orchid farm. I drive to the jetty (it's another one next to the houseboat jetty), and at 1:10pm we start the trip. Now the sun is shining, the sky is blueish and the lake looks very nice. Totally different from yesterday evening in the rain. Beautiful scenery with islands and islets covered with rainforest. At 1:30pm we reach the herbal farm (free entry). This is a small botanical garden with various species of plants and herbs. Quite small indeed - it would be possible to visit it completely in 15 minutes. I'm offered some herbal infusion, very bitter. After half an hour here we leave for the next place, the butterfly farm. It doesn't take long to get there and we arrive at 2:17pm. The butterly farm has again free entrance. It's kind of interesting, but much smaller than similar insect farms I've seen in the Cameron highlands and KL. I spend half a hour there, then at 2:45pm we leave for the next place, the orchid farm. Here there is a moderate RM 6 entrance fee, but there are very few flowering orchids. Many plants, but few flowers, disappointing. We leave this place at 3:25pm and head back to the jetty. Since it is still not that late, I decide to drive until Kuala Lipis, to shorten the driving time tomorrow. I decide to skip Taman Negara Kuala Koh, for which there is no time anyway. Might do that another time. It's about 4pm when I leave the jetty. The road initially is very, very scenic. I basically drive on a road across beautiful rainforest, every now and then seeing lake bays. It's a good road - wide, mostly smooth surface, few holes. Very few cars on this part of the road. Some roadworks ongoing in a few spots along the way. The scenery changes completely after some time. The good road ends, I continue on a small and narrow road and now it's all palm oil plantations and some civilisation. After Gua Musang there is a 40-50km piece of road which is like a motorway: two lanes per side, very smooth surface, mostly straight road with no narrow curves. 90km/h speed limit, but in practice it's like a motorway. At 7:20pm I reach Kuala Lipis and call the hotel. They tell me that no room is available, so I try making a booking over booking.com and it works. Very strange. Then I have some fast food in a KFC restaurant, and after that drive to the hotel. After parking the car, in the darkness I manage to fall into an open trench, which runs parallel to the street. These open trenches are typical for Malaysia and are meant to carry away the rainwater. Initially I had been walking over a grid on the trench when I got out of the car, but when the grid finished, I fall into the trench. The problem with Malaysia is that when you walk somewhere you have to watch carefully where you put your feet. I manage to hurt my right hand. One of the fingers starts bleeding heavily. I cover that with a paper tissue, to stop the bleeding, and wipe away the blood. With that hand covered in a bloody tissue I walk into the hotel lobby. Shocked face of the receptionist who asks what happened to me. I check in and sort of take care of the hand. Maybe tomorrow I'll see a doctor. Cityview hotel Kota Warisan, Sepang (near KLIA). RM 79 for a small room, maybe 3m x 4m, nicely set up with a bed, desk+tble, hair dyer, tea making set, attached bathroom with shower. A/C is adjustable. WLAN available, but very slow. Weather: mostly overcast, with every now and then blue sky and sunshine. No rain the whole day. I check out at 11am and go to the clinic below the hotel to ask them to have a look at my right hand. The wrist is now swollen and stiff. After some waiting it's my turn. It's a Chinese doctor and it seems my wrist isn't broken. He gives me an antitetanus shot and some antibiotics and some pills against the inflammation. I'm done at 11:40am. Then I get to the car. I notice a parking fine which is strange because yesterday the hotel gave me a parking ticket which I put into the car. Back in the hotel lobby I'm told that this parking ticket only allows me to park for one hour from 8am to 9am. She was thinking I would leave by 9am, or perhaps she wanted to save some money. RM 0.40 for an hour of parking, the fine is RM 10. Still nothing if translated into Euro (RM 10 is less than 2 Euro), but now I have to pay this fine and this will make me lose time. Luckily they show me in Google Maps the place where I can pay the fine and I drive there. Then I quickly find the right counter and because there are no queues, the fine is paid by 12:10pm. Time to drive to Fraser's Hill. It's actually less than 100km, but the navigation system calculates a bit over two hours, probably because the last part of the road is a mountain road. And indeed the last 40km are a very bad mountain road, with very narrow lanes, countless narrow curves and a not so smooth surface. The last 8km are a one-way road. This must be the old colonial road, which probably hasn't been touched after independence. I reach the Fraser hill at 2:26pm. The weather is so-so, mostly overcast. I guess with some sunshine and a blue sky this place would be much more appealing. There are several colonial era, British style houses here and there. Lots of rainforest, but also a golf course and some small meadows. The altitude is a bit above 1200m and the air is fresh. I spend eome time having a look at the place. There are a number of trails in the forest, some leading to a waterfall. But otherwise this place is not that terribly interesting. I guess if you live in KL and would like to do some trekking, you could come here and do it. Shortly after 3pm I go to the Tea House restaurant & cafe where I have some lunch. Then I continue having a look at the Fraser's hill. There is a recreation centre with an archery range near the golf court. A big, probably upper end resort (for those who are planning to do a retreat here). At 4:30pm I start driving back to KL. With a couple of stops along the way, I reach the Midvalley mall at 6:50pm. Then, after 7pm I have a dinner with the family of Shirley. Chinese restaurant again, just for a change... After 9pm I drive to the hotel in Sepang, arriving at 10:20pm. Hotel Merry Land, Danang. 1.085 million VND for a nice room with attached bathroom. Adjustable A/C, flat screen TV, fast WLAN, fridge, nice furniture, tea making equipment and instant noodles (not free), electronic safe. The hotel is in a skyscraper in the strip of land between the river and the ocean. The room is on the 12th floor. Breakfast included. Weather: overcast in the morning in KL. A mix of sunny, then overcast and rainy in Danang. Very strong sun in Danang. I get up at 7:30am, then leave the hotel at 8:30am. Some traffic jam, so the expected arrival time at the airport is shortly before 9am. In fact it's just one short section of the road and one roundabout which are stuck. I reach the airport and immediately find the rental car parking. Then I lose quite some time looking for a parking slot, because all Mayflower parking slots are full. In the end I park the car in the Asia Car parking slot because I have no more time. Then it takes some time to figure out how to get to the Mayflower car rental counter, because that is not so obvious. When I'm finally at the counter, there is no staff. I call the hotline, some discussion, in the end I drop the car key in the key drop. Then I rush to the check-in counter. At the Air Asia check-in there is a queue and it's already 9:20am. I ask an Air Asia staff and am directed to a counter. There the friendly guy checks me in without discussion. Boarding at 9:55am I'm told. I reach the gate at 9:40am - extremely long walk to the gate. The layout of KLIA2 needs to be improved - check-in area too far away from the gates. At the gate I meet Shirley, her mom and the kids. Boarding starts late at 10:05am (late arrival of the previous flight). The plane, an Airbus A320, starts rolling at 10:45am and takes off at 11am (25 minutes of delay). The plane is quite full (perhaps 80% full). We land at 12:13pm local time, reach the passport control 10 minutes later, and then wait for a while. Once outside, I buy SIM cards. Mine is from Viettel, has 3.5GB of data and 10 minutes of calls, and costs 5 USD. For a few USD more you can even get one with unlimited data. Very cheap. Hotel Five 2, Kota Kinabalu. RM 105 for a small (10-12m²) room with A/C, a table, TV, phone attached bathroom with shower and nothing else. The hotel is conveniently located in the centre of KL. The only problem is that there is no elevator (have to carry my 24Kg suitcase and other bags to the 3rd floor). Fast WLAN in the room. Bed hard like a stone, shower has only cold water. Weather: sunny, blue sky with some very thin clouds layer in Danang. Quite hot. In the evening it's raining in Kota Kinabalu. We get up at 8am, have breakfast and pack our stuff. In my emails I find the confirmation that my car booking is ok. I have now a car for one week (23.8-30.8) in Kota Kinabalu. 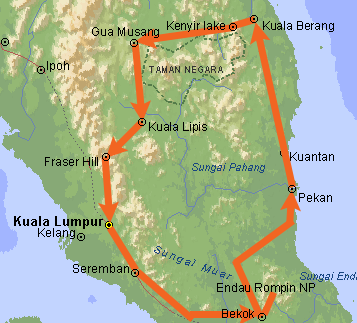 Yesterday evening I have booked the hotels in Kota Kinabalu and in the Crocker range national park. Dinisiah from the Maliau Basin studies centre is expecting me in her office tomorrow, so I'm all set up for my trip across western Sabah. Shortly after 10am we check out and take a taxi (110000 VND) to the airport, arriving at 10:20am. Then we check in. Airasia doesn't allow batteries in the check-in luggage, so I have to remove the powerbank. Fast, free WLAN and smooth procedures at the airport. Before 11am I'm at the gate. There are A/C power sockets using the UK/Malaysia plug. The Airasia flight to KL is delayed. The plane starts rolling at 12:43pm and takes off at 1:06pm, with half an hour of delay. This is tricky, because in KL I have 2:20 hours to chenge flights and I have to go through passport control and check in again. We land in KLIA at 4:35pm (20 minutes of delay). Then I'm one of the first to leave the plane, because the Airasia staff reseated me in front. I quickly get to the passport control. There is only a short queue of 5-6 people. Then I manage to quickly retrieve the luggage (mine is one of the first to come out, sheer luck I guess) and at 4:57pm I'm at the check-in counter of Airasia. Since it's not so late and the queue doesn't look so long, I just queue up. When it's my turn I'm told that for domestic flights I should have checked in first at the machine and got a boarding pass. Never mind. By 5:11pm I have the boarding pass and can walk to the gate. Pretty smooth operation - 36 minutes to go through passport control, retrieve the luggage and check-in again. The 6:35pm Airasia flight is delayed. It takes off at 7:15pm with 40 minutes of delay, but luckily lands in Kota Kinabalu at 9:35pm, with just 20 minutes of delay. I get out, retrieve my luggage and take a taxi to the hotel, arriving there at 10:18pm. Manis Manis Rooftop of Borneo resort, Crocker range national park. RM 320 for a room, big, rather basic but functional. No TV, no A/C (not necessary, a heating would rather be needed), some furniture (table, desk, chair). Attached bathroom, big, but also rather basic and when people from the neighbouring rooms use the common bathroom, there is not enough water in the bathroom. Shower water heater not powerful enough (you have to set it to very little water output, if you want to have warm water). Overall not a place where you want to spend more than one night. Weather: very heavy rain in the morning in Kota Kinabalu, strong winds, like a typhoon. On the Crocker range in the afternoon there is beautiful weather: sunny, but with a clouds layer (milky-blue sky). Fresh at altitude in the Crocker range national park. I get up at 9am and check out at 10:30am, leaving the bags in the hotel. When I ask for a taxi, the hotel staff suggests to use Uber. So I install the app, and quickly am able to order a car with driver. This arrives quite speedily. I reach the Tun Mustapha Tower shortly after 11am, then get up to the 12th floor, where the office of the Conservation & Environmental Management Division is. These are the people who administer the Maliau basin, the Imbak canyon and the Danum valley research centres. There I have a long chat with Dinisiah, the lady with whom I have been in touch so far. We make up a small plan which consists of a trek in the Maliau basin (one night in the basin, two in the studies centre), followed by a trip to the Imbak canyon (two nights spent there). Above all, the transfers to the Imbak canyon are expensive (Telupid - Imbak Canyon RM 500 each way). Shortly before 12pm I'm done and I walk out. Then it starts raining heavily, the Uber driver doesn't manage to find me, so I order a new one. I'll be back at the hotel only at 1pm. I try to tell the Uber driver to wait for me because I just need to take my luggage and then I go to the airport. Somehow he doesn't understand me, because when I'm out again with the luggage, he's already gone. The Uber app still shows me on the way to the hotel, so I can't use it to book a new driver. Finally I go to the hotel and ask them for a taxi. They then book a car for me. The curious thing is that the price they get is RM 5.24. But the distance to the airport is bigger than the distance to the Tun Mustapha Tower and for that transfer I paid RM 8.60. Perhaps Uber makes lower prices for local Malaysians. By the way, since 12:20pm, every 10-20 minutes the guy from the Mayflower car rental is asking when I come to pick up the car. That's because I had declared a pickup time of 12pm. I'm at the airport shortly before 2pm. There I have some quick lunch at a KFC restaurant, then I proceed to the Mayflower car rental counter. Finally at 2:45pm I leave with the car, another Nissan Almera. Since it's already late, I take the shorter coastal road (was initially planning to drive via Tambunan). Initially the road proceeds mostly through more or less urban areas. It's only after a while that the road turns inland, to less urbanised areas. Pretty cool scenery, mountains and rainforests. I find a "Dimie Pedalaman resort", in a very scenic spot. At 4:52pm I'm at the gate to the Crocker range NP (entrance fee: RM 10). Shortly after that I check in at the resort. I take a walk and have a look around the area. Around 1300m of altitude, the air is fresh, very nice scenery. There is one 2km long trail which I don't do because it's already 5:30pm. Later I will hear that this is the only trail in this place (but there are more trails in other parts of the national park). There is some kind of fern and insect exhibition at the headquarter below. In the evening I have a dinner in the restaurant of the resort. Hotel Juta, Keningau. RM 135 for a nice, business level room with a lot of furniture, basically 4 star style. The only thing is that it's an old hotel. Carpeted floor, flat screen TV, but no fridge and no electronic safe. The WLAN in the room is not functional. However the A/C can be switched on and off and the temperature can be precisely set, and the bed is soft. Found this place with Google Maps (it's not in the booking portals). Next to the hotel there is a KFC restaurant, a Maybank branch and a supermarket. Weather: a mix of overcast and sunny in the morning, then after 2pm it starts raining. It rains more or less heavily with some interruptions until the evening. Quite fresh at altitude. In the morning I check out at 11am, then drive to the beginning of the Denai Crocker trail. It's a 2km trail and the hotel staff told me it's circular. I'm planning to spend the next 1-2 hours on it. 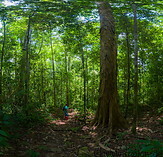 It's a nice, wide, well maintained trail, which is mostly covered by the rainforest canopy. It becomes quickly clear that this is not a circular trail, because at one point the trail starts getting down the mountain. It's also quite steep in some sections. I run into a group of (probably) Japanese bird photographers, judging from the cameras with the very long lenses. The trail ends at the headquarter of the Crocker range national park (the real HQ). It's a building along the street and I'm there at 12pm. Opposite the street there is a cafe/restaurant. I check it out and order some fried rice (RM 6, quite cheap). After lunch, at 12:40pm, I start walking back along the trail to the place where I started my trek. I'm back on top shortly before 1:30pm. I can already see the bad weather approaching from the west. I get back into the car and drive to the administration building of this substation. There I check a bit the area and the exhibits in the administration building. I notice that there is a second trail, the pine trail, which I might do. When I ask where the trail begins, I'm forwarded to various people until a knowledgeable lady shows up. This pine trail is not in use, because at one end there are many snakes (including cobras I'm told). More discussion, what the attractions in the Crocker range national park are. The Mahua waterfall should be interesting. About a 1:30 hours drive from here. Then suddenly this lady mentions that this is the first day of a blooming rafflesia here in the park. Must say that all these years I've never managed to catch sight of a rafflesia in full bloom (always some stage before or after the full bloom). So, I walk down the staircase and join a group of people who are also going to have a look at the rafflesia. The rafflesia is quite cool, but is not yet fully open. Apparently I have to come back tomorrow. After some photos I walk back up to the administration building. By now it's already 2:15pm and it has already started raining. Since there is no point to spend the rest of the day here, I get into the car and key in the Mahua waterfall into the navigation system. Expected arrival time 3:50pm. So I drive first down to Keningau, then along the road towards Tambunan. Not terribly impressive landscape. Some rice fields every now and then. After Tambunan, the road splits into roads going to KK and to Ranau. I continue along the road towards Ranau, then at one point turn left and drive up the mountain. Quite steep road in some sections, I could use a more powerful car. I reach the Mahua waterfall parking at 3:54pm. Here there is another substation, with administrative buildings. Another RM 10 ticket to get to the waterfall (local Malaysians pay RM 3). After I buy the ticket, the guy tells me there ia a rafflesia in full bloom. Wow, today is rafflesia day. Whenever you don't ask for it, things happen. But if you go to a rafflesia area looking for a rafflesia, you don't find one. To get to the waterfall, it's 500m walk across beautiful rainforest, along the Mahua river. The forest alone is already worth the trip to this place. The waterfall itself is also very nice, although not that big (perhaps a 20-30m drop). By the way, in the meantime it has started raining again. When I'm back at the gate, the guy is about to leave. Some discussion regarding the rafflesia. Finally he finds somebody who will show me the way. Steep climb for about 10 minutes, along slippery and muddy trails. Finally we reach the rafflesia site. There is actually two of them, about 3 metres from each other. These ones are completely open (fourth day of blooming I'm told). At 5:10pm I start driving to Keningau, arriving there around 6:30pm. Before going to the hotel I stop in a Giant supermarket and buy a lot of food and stuff I'll probably need over the next days in the Maliau basin. Then I drive to the hotel, check in and have a dinner in the nearby KFC restaurant. Maliau basin studies centre. RM 95 for a bed in the hostel. The place has A/C power from 7am to 11pm, a common bathroom, common kitchen. Nice wooden complex in the rainforest. Only fan, no aircon. Weather: good weather, sunny, blue sky until about 2pm, then it rains intermittenlty until 5:30pm. I get up at 8am and check out at 9:15am. I get some cash from an ATM (manage to withdraw RM 2300 in one shot). Then I buy some groceries in the Keningau mall and by 10:20am I'm on the way to the Crocker range national park. I want to photograph the rafflesia which yesterday was only partially open and today should be fully open. From Keningau it's a short 20 minutes drive to the Crocker range NP. In 20 minutes the road climbs from the 320m altitude of Keningau to the over 1100m of the Crocker range. I stop at one point to take a panorama shot, then shortly before 11am I'm at the rafflesia. Right now it's fully open. Beautiful flower. I spend 20 minutes at the rafflesia, then walk back to the car. On the way I run into a group of Malaysians who have come to see the rafflesia. One of the ladies is wearing a tight skirt and high heels. I guess she will have some problems walking down the muddy ground to the rafflesia. Then I drive to the cafe/restaurant of yesterday and have some early lunch there. Around 12pm I start driving towards the Maliau basin. The road initially is ok, but after a while it becomes very bad. In several sections the asphalt cover is gone and the road is just a dirt track. Where the road is paved, it's full of holes. And this road has just been completed one year ago, in 2016. Obviously the road hasn't been built to the required standard. I speculate whether corruption has played a role. With a couple of stops along the way, I reach the Shell Maliau basin reception & information building at 3:08pm. I leave my name and data and park the car in the parking. Then a guy shows up who drives me with his 4WD vehicle to the Maliau basin studies centre. On the way we stop a few times for some photos, once at an observation tower for about 10-15 minutes. We reach the studies centre at 4:20pm. By the way, the road is currently being completely paved. Once that is the case (should be by the end of 2017 according to the driver), it will be possible to drive to the Maliau basin studies centre with a normal 2WD car. This looks like a sort of majestic building. Big structure, totally wooden, many other buildings in the complex. It's by now raining heavily. I walk up the stairs, register and pay the RM 1300 of this 4D3N trip. Then I unload my stuff into the hostel and stay there until it stops raining. After 5:30pm, when the rain has stopped, I walk around the area. It's a large complex with several buildings around a pond, all nicely set up with wooden plankways crossing the pond, illuminated at night. Everything is surrounded by rainforest. When I have a closer look at my invoice, I notice that I'm being charged RM 254 for cooking utensils and the gas stove. Which is a bit pricey because I'm actually only boiling some water for the instant noodles I brought with me. It's RM 254 because they calculate four full days of use of cooking utensils and the gas stove. But actually on the last day I will be leaving early in the morning. So I send a message to Dinisiah asking her to revise the invoice and issue a refund. The problem with the Maliau basin is that there are fees for everything. You leave out the food, thinking that you save RM 700, but then are charged RM 254 for cooking utensils and gas. Later in the evening I have dinner and at 8pm there is an informative video about the Maliau basin. Tomorrow the plan is to trek to the Ginseng camp. Ginseng camp. Sleeping bag in an open air rainforest shelter, covered by a roof against the rain. Toilet facilities, but apparently no showers. RM 95 for the sleeping place + another RM 73 for the use of the kitchen facilities (rather basic, but there is a gas stove, with which to boil water or cook). A bit overpriced considering how spartan the conditions are, but then this is the Maliau Basin. Near the camp is the Ginseng waterfall, but the access is not easy. You need to walk on a muddy trail, then cross a stream, then climb again on a steep slope, all the time being ambushed by hungry leeches. Weather: overcast in the morning, then the sun comes out. Rain between 2 and 3pm, then sunny again. Not too hot in the forest trail. I get up at 7am, then am at the reception for the trek at 8:15am. I leave my stuff in the reception, then wait. We'll only leave after 9am, because some Polish tourists have to finish their breakfast. At 9:08am finally we start. Today it's the Polish couple, myself and a group of Asian travellers (maybe they are Malaysian). We drive on a to a large extent paved road, reaching the Agathis camp at 9:25am. This is a no longer in use jungle camp, because it was damaged by the elephants. Here my bag is weighted. Seven kg, five less than the 12 kg limit. Suddenly I hear somebody mention that his sleeping bag is so heavy. Dang - I totally forgot to ask for a sleeping bag in the reception. I tell the guide, the guide rushes back to the car parking, but the car is already gone. So he uses his radio to tell the reception to send a sleeping bag. We wait for a while, then, since it is already late, the guide suggests that the porter will wait for the sleeping bag and we should start the trek now. It's 9:45am. So we start walking along the trail. From the Agathis camp at 500m of altitude we'll climb up the rim of the Maliau Basin, crossing it at almost 900m of altitude, then walk down again to the Ginseng camp at 700m. Initially the trail has a very gentle slope and is easy to walk. It goes through 'standard' tropical rainforest, nothing too spectacular. It goes up and down a bit for a while, until becoming a bit steeper towards the end. At 12:30pm, when we are on top of the rim, the guide suggests to make a lunch break. We're not far from the Ginseng camp (just 3km) and I would have done this lunch break at the camp, but the guide seems eager to stop here. It would actually have been better not to stop here, because in the middle of the rainforest, if you make a break somewhere, immediately mosquitoes and leeches come. At 12:40pm we continue walking. Now we are descending from the rim towards the Ginseng camp. The trail gets increasingly difficult. Very steep, on a very steep, almost vertical slope. Then it's slippery. The trail is secured with ropes. This last part of the trail is the most challenging one and the one requiring the most concentration and energy. Finally at 1:47pm we reach the Ginseng camp. This consists of a dormitory area (building with open walls but with a roof), a kitchen /administration building, a toilet complex, no showers (you have to empty buckets of water on yourself if you want to wash yourself). It's not even 2pm and in principle there is still time, so I ask if we could walk to the Maliau falls and back. The guide is not exactly eager to do so. He mentions that the trail is not as easy as the one we have done so far and that there is not enough time. So we stay here. The guide lets the water tank run a bit, probably to cleanse the pipes, then fills two pots and boils the water to obtain drinking water. Later, when I have a closer look at the water, I notice that it is not clear. It has some slight mud colour, probably because it wasn't filtered. The germs have likely been killed since the water was boiled, but the water has a weird taste and a weird colour. Not exactly something you want to drink. But there is no other option, because it's the only drinkable water here. I guess next time I do a jungle trip, I'll bring along a water filter, if such a thing exists. Guide and porter spend the rest of the day at the camp. I try to walk to the nearby Ginseng waterfall, but the trek is too tough. Steep and slippery, then you have to take off the shoes to cross a river. But on the other side there is no dry and clean place where to put on again the shoes. Walking barefoot is not an option (you hurt your feet and there are leeches) and using slippers is also not an option in such a trail. So I walk back to the camp. I'll spend the rest of the day there. Late at night, after 9pm, I hear a noise in the kitchen. I turn around and see something which looks like a big cat, light brown, quickly disappearing below the kitchen floor. Later, at night, at 4am I wake up and notice a small furry animal in my bed. Either a rat or a squirrel and it quickly runs away. Perhaps this animal came looking for food. With such an open shelter, animals can come in anytime they want. Bed in the hostel of the Maliau Basin studies centre. Today I'm the only guest and have the entire hostel for myself. Weather: mostly sunny with clouds in the morning an until about 2pm. After 2pm some rain, on and off (it rains for 30-60 minutes, then stops, then starts again later). I get up at 8am and take a cold shower. Then I get ready, have some breakfast and pack my stuff. The guide asks me if I still need the porter, because if yes, it's another RM 100 for his services. My bag is now less heavy than yesterday and we will go more downhill than uphill. But I have no space for the sleeping bag in my small backpack and my camera bag alone weighs more than 6kg, so the combination of the two bags is a bit heavy. I let the porter carry again my bag. He seems to be happy about that (and today he is bringing the rubbish down to the studies centre - his total load ends up being 22kg). We set off at 9:45am and walk the same trail of yesterday in reverse direction. For some reason today I'm not as fit as yesterday. I walk with very few breaks, but in the end arrive at the Ginseng camp only at 2pm. When we reach the Agathis camp, the porter and other people are waiting for us. One of the guys is somebody who walked to the Ginseng camp to leave the food for a group of trekkers who tomorrow will be there for the night. Basically if you book the food package, you end up eating food which has been cooked two days ago. Shortly after 2pm the car leaves and drives us back to the studies centre. We arrive there about 20 minutes later, and shortly afterwards it starts raining. I get my things from the reception and bring them to the hostel. First thing I do, I drink two bottles of isotonic drink. Not sure why I am so thirsty. Maybe I should have drunk more water when walking down the trail. Then I spend the afternoon resting, sorting through my things and the pictures and eating something. Tomorrow I'm driving to the Imbak canyon. Accomodation in the Imbak canyon studies centre. Originally I pay RM 95 for a place in the hostel. Upon arrival I'm upgraded to a private room. This is HUGE, has A/C, building built with concrete walls, brand new (finished in November 2016). The interior is clean, but relatively simple. There is a bed (a bit hard), table + chair, some kind of small cupboard (not for clothes). The toilet has hot water (electric water heater). There is A/C power from 7am to 11pm. When I arrive at 10:40pm I'm given a "grace" period to settle in and there is power until 11:20pm. The entire complex is huge, extends over an area of 300m x 200m, with countless buildings (research facilities, staff quarters, VIP lounges etc.). Weather: mostly sunny, blue sky with some clouds the whole day. In the afternoon after 3pm some limited rain. Surprisingly dry in the Imbak canyon area. I'm being told it hasn't rained for three weeks. I get up at 8am and check out at 9:15am. By 9:20am I'm in the 4WD car towards the gate of the Maliau basin, where I parked my car. On the way we stop at the viewpoint for some photos. At 9:53am I'm in my rental car and start driving to the Imbak canyon. According to the Google Maps navigation system it's a 5:44 hours drive, so I should arrive in Kampung Imbak before 4pm. However things do not go as they should and the culprit is Google Maps, which has chosen a road which is no road (unless you are driving a 4WD car which can cross rivers). Essentially Google Maps directs me to a road south of the Gunung Trus Madi mountain, which at one point ends in a dirt track. Fine, I drive this dirt track for a while, hoping that it becomes a paved road again (which sometimes happens here in Sabah). But at 1pm this road ends in a river, i.e. you have to cross this river to continue driving. No problem for a big 4WD car, but impossible for a 2WD saloon car. So I have to backtrack, and drive to Keningau first, then on to Ranau and Telupid. In the meantime the fuel indicator of the car is low, and the next petrol station according to Google Maps is only in Keningau. Luckily Google Maps is wrong again and I find a petrol station in Sook, 40km before Keningau. I send a message to Dinisiah that I have a problem and that I'll be in Kampung Imbak around 8pm (not 4pm as originally expected). Dinisiah must have reacted quickly, because Darren, the host in the Imbak canyon studies centre calls me and enquires about my current location and expected arrival time. In Keningau I stop briefly at a KFC restaurant, to have some chicken meat (haven't eaten meat for the last few days). It's 3pm when I continue driving. The road section between Tambunan and Ranau is horrible. Narrow mountain road full of curves, but the big problem is the poor status of the road. It's full of holes, on some parts the tarmac is missing, elsewhere sections of the road are missing. The scenery by the way is absolutely beautiful. It's a pity I have to rush so much. Around 5:15pm I reach Ranau and get stuck in a huge traffic jam where I lose about 15 minutes. A bit later the navigation system indicates 160km left, 2:47 hours still to drive, expected arrival time in Kampung Imbak at 8:15pm. This Google Maps forecast assumes that you drive non-stop at the maximum allowed speed. Due to slow driving trucks which are had to overtake on some road sections (Ranau to Telupid is full of curves) I lose another 25 minutes before I reach Kampung Imbak. By the way, from Telupid to Kampung Imbak initially it's a very good road (straight, few curves, little traffic). The last 15km are a dirt track however. I arrive in Kampung Imbak at 8:40pm. Now the question is, where do I meet the people of the Imbak canyon studies centre. I drive a bit around, then get back to the market. There I ask the locals if they know anything about an Imbak canyon studies centre. Of course they do not, what was I expecting. The problem is also that my phone seems to have no line in this place. It takes several tries until I manage to call Darren. Then Darren gets involved in a long discussion with the locals. Finally two locals get into my car and bring me to the information centre of the Imbak canyon studies centre. It's a facility with an exhibition and an office. I register there and wait for the car to the Imbak canyon studies centre to be ready. 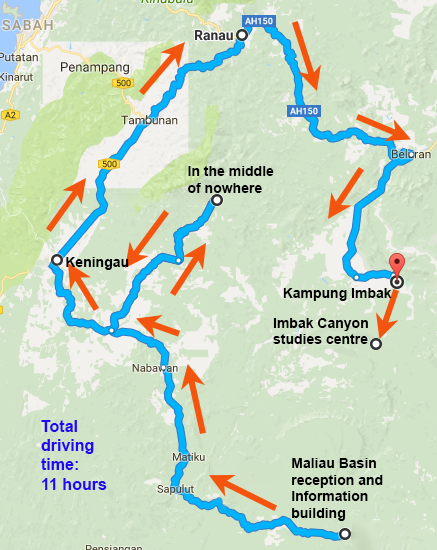 At 9:16pm we start driving to the Imbak canyon studies centre. These are the last remaining 38km of this day. The road is a dirt track, not a good one. It's a dirt track for which you need a heavy 4WD car. We drive in the darkness, up and down the hills. We see a small animal crossing the street, and later the driver spots a leopard. The road passes by palm oil plantations. There seem to be everywhere in Sabah, even in the remotest corners. Finally at 10:40pm we reach the Imbak canyon studies centre. This place is unbelievable. Huge and modern, it's amazing that in the deepest of jungle suddenly you find such a modern complex. Darren, a Dusun tribesman who works here, is still there. He has been waiting for me all the time. Some more discussion and a bit after 11pm I get into the room. Weather: sunny, blue sky with some clouds, hot. No rain the whole day. I get up at 8am. At 9am Darren calls and asks when I'm ready for the activities of the day. At 10:15am I get out of the room and slowly walk towards the office building. Then I meet Darren who is telling me that he is preparing a presentation for me. At 10:45am this presentation starts in the office building. The Imbak canyon studies centre has been completed in November 2016 and is located inside the Imbak canyon. It can house 600 visitors. Currently there are about 50 employees working here and the centre receives about 80 visitors per month, although this number is expected to rise substantially. A scientific expedition (all Malaysian except for three non-Malaysians) has just spent a few days at the centre and then left. The Imbak canyon studies centre is going to be officially launched in September 2017, then there should be more visitors coming. At the moment there is still a lack of activities for tourists. There are just two trails, the canopy walkway is not completed yet and other attractions have yet to be added. In addition, because of all the noise which the construction of the centre generated, I'm told the animals are traumatised and avoid the area. It will probably take some time until animals dare to get back to the area. Another problem is the access to the centre, because the road is very bad (a dirt track used also by logging trucks). Getting here is not easy. All in all, it appears that the Imbak canyon studies centre still needs a year or so to achieve it's full tourist potential. The Imbak canyon itself is a 25km long valley, bordered on three sides by sandstone ridges. Strictly speaking not a narrow canyon or gorge, as the name would imply. The rainforest here has never been logged. In fact the area is full of beautiful rainforest with tall, majestic trees. The Imbak canyon is within the forest area managed by Yayasan Sabah (the Sabah foundation, a company owned by the Malaysian government, which also manages the Maliau basin and the Danum valley, i.e. all the coolest wildlife areas in Sabah except for the Kinabatangan river and Tabin). Within the Imbak canyon (or around it) there are 45 villages which are only accessible by boat, where people apparently still lead a traditional lifestyle. A number of species of animals and plants are endemic to the Imbak canyon. The Nepentes hirsuta, a pitcher plant species, has only been found here and in the Maliau basin. After the presentation, at 11:30am I walk to the viewpoint from where there is an overview of the Imbak canyon and the studies centre. After lunch, at 12:40pm, the afternoon trek starts. Every visitor who wants to trek in the forest has to be accompanied by a park ranger (fee: RM 50/hour). In addition, Darren is also walking with us. We initially cross the Kapur suspension bridge, then start walking in the rainforest. Then we take the riverine trail, which leads to the big Belian tree, the Belian camp and the Imbak waterfall. The trail is not bad and quite plain. We reach the big Belian tree at 1:27pm. This is a very tall tree made out of very hard wood. At 1:45pm we reach the Belian camp, which was set up for researchers who spent some time living in the forest. Now it seems to be in disuse. Regarding leeches, here there are fewer leeches than in the Maliau basin. Over the course of the trek I only have to remove 4-5 leeches from the leech socks. Perhaps it's because the area here is more dry than the Maliau basin. A few minutes later we reach the Imbak falls. To get to the frontal view you need to cross a suspension bridge, then walk down. The waterfall is not very tall (just 6m), but quite wide (30m). The water is brownish due to the tannins of the leaves which fall into it. Very picturesque view. After the waterfall, at 2:10pm, we start walking up to the Bukit Imbak hill (365m). An a bit steep climb, because in Malaysia the trails all go directly upwards (unlike in the European alps, where the trails do serpentines to avoid too steep gradients). It's a tiring walk. Along the way we spot some Nepentes hirsuta pitcher plants. We reach the top of Bukit Imbak at 2:40pm. There we take a long rest. Finally we take a shortcut back to the studies centre, because the guide thinks it might rain soon. We're back at 3:40pm. In the remaining part of the day I don't do much. I take a shower, drink a lot (have lots a lot of liquids on that trek) and sort through the photos. Mandarin hotel, Kota Kinabalu. RM 191 for a small (maybe 15m², but nice and modern room. This seems to be an old hotel which has recently been completely renovated. The room is very nice and functional. Has LCD TV, desk, chair, cupboard, phone, electronic safe, comfortable bed (not too hard), many A/C sockets, aircon unit with remote control. Ths highlght is the bathroom with shower: very elegant, looks brand new. The hotel is centrally located in KK next to the Millimewa supermarket. Weather: in the morning a bit more cloudy than yesterday, later in the morning it rains a bit. Over the course of the day, sunny with clouds, then some rain after 3pm. In the morning at 9:30am I walk to the reception, because I need to call the car rental. I'm supposed to return the car by 12pm noon today and want to ask if I can have it for two more days. The answer is no, they need the car by tomorrow 2pm, because somebody else is renting it. So I have to change my plans and be in Kota Kinabalu this evening. At 10:20am we start the trek of today. It's the second trail of this studies centre. This starts with the other suspension bridge and leads into the forest on the other side of the studies centre. I'm walking with a female forest ranger, Darren and two locals of Kampung Imbak who came here because they were curious. Immediately we are in front of a huge tree. Very large trunk, very tall tree. Over the course of the trek we'll see many of these large trees. At 11am we reach the actual highlight: a place in the forest where a large number of Nepentes plants grow. I've never seen so many in one place. Then we turn back and slowly walk back to the studies centre, arriving there at 12pm. Since I'm full of sweat I head back to the room and have a shower. Then I have lunch and pack my things. At 1:15pm I call the reception and ask for a car. The car will arrive about 20 minutes later. After paying the bill (they are not charging me the ranger fees), at 1:50pm we start driving back to Kampung Imbak. Together with the driver we have three more people in the car: a staff girl and the two people from Kampung Imbak who did the trek. 15 minutes later we have to get back to the studies centre because the car has a broken wheel. At 2:30pm we leave again the studies centre in a new car. This time the driver needs only 1:05 hours to reach Kampung Imbak (vs. 1:20 hours when we came here). I leave Kampung Imbak in the rental car around 3:45pm. The drive to Kota Kinabalu proceeds without problems. For a large part (Telupid to Ranau and Ranau to Kota Kinabalu), the road is a mountain road with many narrow curves. Difficult to overtake slow trucks. Shortly before 7pm I refuel the car in Ranau and have some fast dinner in a KFC restaurant. Then I start the night drive across the Mt Kinabalu massif to Kota Kinabalu, reaching the hotel at 9:52pm. Weather: sunny, blue sky with some clouds, hot, until about 6pm. After it rains lighrly for about two hours. In the morning shortly after 10am I return the car to Mayflower. About 1400km in eight days, the car is in the same state as I received it (i.e. no damages caused by me). The bill is RM 868 for the eight days I used it (+ the 40 Euro commission I paid to Holiday Autos). Then I have some food in a Chinese restaurant near the hotel (simple chicken rice, the full menu is only available in the evening). Today is Merdeka day (Malaysia national day) and you can see it in KK. Everywhere there are flags of Malaysia and Sabah. At 11:50am I'm in an Uber car to the jetty, arriving there at 12pm. I check the boats to the islands. I'd like to do 3-4 islands, but for that you need to charter a boat which is a bit too expensive (RM 500). The only affordable option (RM 40) is to visit two islands (Manukan and Mamutik), leaving immediately. Hop from Manukan to Mamutik at 2pm, back from Mamutik to KK at 5pm. So I buy the ticker and get into a boat full of Asian tourists. Besides Malaysians, there are many (young) Korean tourists everywhere and probably also some mainland Chinese. KK is connected by direct flights with Seoul, and is not so far away from South Korea (3700 km) which would explain the large number of Koreans. Leaving at 12:08pm we reach Manukan at 12:30pm (very rough ride on the sea). Today it's full of people, probably due to the public holiday. There is long beach and another, smaller one which probably belongs to a resort. The seawater is not clear and very shallow. To reach deep water you'd have to walk over coral, i.e. swimming is not feasible. Snorkelling also not really, although there is a lot of fish there, even aggressive one (small fish which bite your legs). Lots of facilities on the island: plenty of restaurants and shops, mass tourism place. A mix of female visitors, some covered from top till toe, others wearing a bikini, some a mix of that. People in waist-deep water with safety vests. At 2pm I take the boat to Mamutik island. This is much smaller, with fewer facilities. But also here there are public showers, good to remove the salt after swimming in the sea. I swim in the sea also here, but three hours (2-5pm) in a small island like this are a bit too much. So at 4:20pm I take a boat back to KK, then an Uber taxi to the hotel (driver complaining about the short distance; only RM 3 fee). In the hotel I take a shower, get rid of the sun tan lotion and then get out again shortly before 6pm. Somehow difficult to find a 7/11 convenience store or something similar. In the evening I have a grilled fish dinner along the waterfront (market area, where 100g of fish go for RM 5). Hotel Cititel, Kuala Lumpur. RM 232 for a small room with lots of furniture, TV, fridge, centralised adjustable aircon, electronic safe. The thing with this hotel is that it is really old, otherwise it's ok. Most of all the location is very good, in the Midvalley mall. Weather: sunny, blue sky with some thin clouds in Kota Kinabalu. Good weather initially in KL, then rain after 4pm. I get up at 8am and check out at 9:30am. Then I take an Uber car (RM 9.54) to the airport, arriving at 9:50am. I check in and proceed to the gate. The 11:30m Airasia flight to KL takes off at 11:45am, with some small delay. Due to some favourable tailwind the plane lands in KL at 1:55pm. Things then proceed smoothly and I quickly retrieve my luggage. Then I try taking an Uber car to the Cititel hotel. The fee is RM 78, only a few RM cheaper than a normal taxi. When I arrive at the hotel, in front of me there is the car with Shirley and the kids - what a coincidence. We check in the hotel and later around 4pm have some late lunch together. After 5pm I take another Uber car to KLCC. Something must have gone wrong, because Uber initially shows a price of RM 9, but later charges me RM 17.60, almost double the price. Very weird and I complain to Uber (a few hours later, Uber will refund RM 7.6). A lot of new buildings have been added around the Petronas towers. Now it's really a forest of skyscrapers and more are being added. Also around the Midvalley mall many new skyscrapers are being added, for office and residential use. It looks as if all development in Malaysia was concentrated in KL. But no money seems available to fix the very bad roads in Sabah. Around the Petronas towers it's full of people. And actually the interior of the towers, the Suria mall, is starting to look a bit aged. A bit after 6:30pm I walk out of the Petronas towers and proceed towards Bukit Bintang road. Not much has changed since last year, until I'm in Bukit Bintang road, which in the evening looks quite modern and flashy. On the site of the former Sungei Wang mall they are building a skyscraper, perhaps for office use. There is also a new MRT station right below the intersection with Sultan Ismail street. New MRT line which didn't exist in the past. I have some food in the Pavilion mall, then get back to the hotel. Weather: sunny in the morning and until about 3:30pm, very hot. Not a clear blue sky, kind of white-light blue due to a thin clouds layer. Rain after 4pm for about one hour, then overcast. Day spent not doing much, basically chilling out a bit. Around noon we meet Suchen and her husband for some lunch in a restaurant in the Garden's mall. Then Suchen and her husband drive me around KL a bit and finally at 2:20pm drop me off at the old Istana (the royal palace) which today is open for visitors. RM 10 entry ticket (RM 5 for Malaysians) and inside the building photography is not allowed. From the outside the building is quite nice, but inside it's basically a replica of European royal palaces. I'm done with the old Istana after 20 minutes, then I try out the Grabcar app and call a car to Petaling street. Grabcar is a Malaysian competitor to Uber. The functionality is similar, the only difference is that with Grabcar the 20% Grabcar share stays in Malaysia, while the 25% Uber share goes to the USA, so basically by using Grabcar instead of Uber you are supporting the local economy. However it seems that at the moment Uber has more drivers, i.e. sometimes you have to wait a minute or two more. Pricewise there is not much difference - sometimes Uber is cheaper, sometimes Grabcar. Around 3pm I'm in Petaling street. It's still the same old place, selling cheap imitation goods. As usual lots of sellers and many tourists. I walk the street until the end, then, when I walk back, the sellers start packing their stuff and bringing it away. After some brief meal in a KFC restaurant, I slowly walk towards Bukit Bintang street, passing by Jalan Pudu. I pass by some new hotels which have recently opened. The Swiss Inn is still there, and must be getting aged. This place has been around for at least 20 years. When I want to turn into Bukit Bintang street, this is impossible. Due to some roadworks the access is now blocked for pedestrians. So I turn left into Jalan Alor. This is a road parallel to Bukit Bintng street, full of restaurants. And while I'm there it starts raining. I wait a bit until the rain is less strong, then continue walking. The Season's View hotel which I used a lot the first time I came to Malaysia in 1999-2000 is now closed and actually something new is being built there. Finally I walk into Jalan Sultan Ismail and from there I call a car back to the hotel via Grabcar. RM 14 fee, quite reasonable. In the past, before Grabcar and Uber were available, you had to pay two or three times the metered fee if you wanted to take a taxi in this area (taxi drivers would refuse to use the meter). Now, with these car call apps there is a lot of transparency. The drivers have a history, get rated, can't cheat. Once back in the hotel, I take a rest there. At 8pm I have some dinner in the mall. We get up very early at 6am, then at 6:45am leave by taxi (RM 90) to the airport. We reach the airport shortly after 7:30am and check-in. Then we take the 9:30 Oman Air flight to Muscat. This lands in Muscat at 12pm local time. Only USB charging sockets in the plane. no A/C power sockets. The airport in Muscat is relatively small and old (but a new one is scheduled for completion in November 2017). Airport buses bring us to the terminal, then we proceed to the transfer area (boarding pass is chopped at a checkpoint). Then you have to get through a security check and you can proceed to the gates. Exchange rate for the Omani Ryal is 2.4 to the Euro I'm told. There is not that much time in the airport, because there is just 1:50 hours between flights. Very, very few usable A/C power sockets at the terminal. The Oman Air flight to Munich (scheduled for 2:05pm) is a bit delayed. The plane starts rolling at 2:20pm and takes off at 2:30pm with 25 minutes of delay. We touch down in Munich at 6:40pm, 20 minutes ahead of schedule, and are home by 9pm.